William and I (Braley) were in the hospital and unable to attend the Rollin' Razorbacks Benefit held Thursday night. We did get pictures and running commentary throughout the game. This video, made by William’s classmates and posted on facebook and YouTube, was shown at half-time. There was a big turnout, and it seems like everyone had a good time! 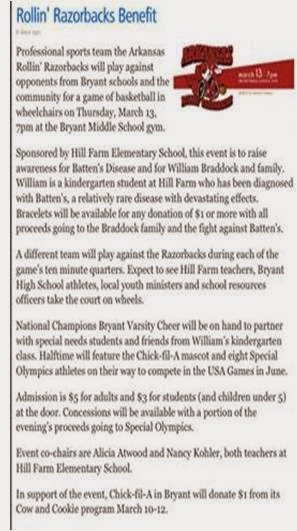 The spectators learned about the rare disease, Batten Disease and about William's Journey. With education, comes a cure! Thank you, Hill Farm Elementary School along with MANY volunteers! 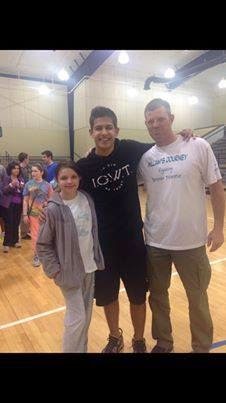 It was so nice of Spencer Lloyd and his family to come out and support the night. They are a selfless, giving family! Spencer (Bryant's own! American Idol top 15) has a heart of gold, I wasn't able to be there but so impressed by his integrity. 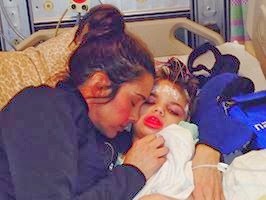 Back at the hospital: William’s EEG showed a constant firing which means he is very unstable, but nothing was established enough to be considered a seizure. However, the episodes I have been seeing are seizures per “Dr. Braddock,” but neurologists typically don't change medications/dosages until the patient is having these episodes multiple times daily. It was also confirmed that William’s symptoms are autonomic dysfunction, which is not really good. It happens with brain injury, so I’m not surprised. I actually suggested to the doctors (and they agreed), it could just stay the way it is, go away, or get worse and interfere with breathing, etc. They didn't tell me this, but I just know. It all involves the hypothalamus which controls a lot, but he is fine for now. We are going to give him more Clonodine throughout the day to try and keep the "storms" (as they are called) away.